Both Charlotte and Emily finish writing a devoir named L’Amour filial. Emily also finished Lettre d’un frère a un frère. 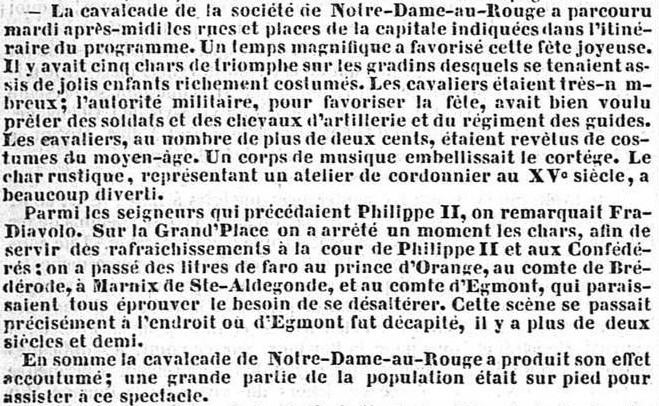 Gustave Charlier, in his article about cultural life in Brussels in Villette, argued that Charlotte saw today’s performance of Rachel, in Ariane. This may not be true. Charlotte did see her in London almost a decade later, and may have used that for her ‘Vashti’ chapter in Villette ; a letter of hers suggests that she had never seen her before this. It can’t be excluded though that she did see her in Brussels. In 1842 Rachel was already a somewhat controversial woman, but in the following years she became ‘scandalous.’ Charlotte of course would dissociate herself from such behavior. It could be a reason why in her letter she did not admit having seen Rachel in Brussels. But in using Rachel for Villette Charlotte must at least have remembered the excitement of the city in these days. This play was billed as Rachel’s last performance in Brussels, so there would have been a run for tickets. Next day it was announced she would give three more performances in Brussels. The Journal de Bruxelles reported that a house at the corner of the Rue des Chartreux was hit by lightning. Charlotte finished a drawing of a tree and a cottage. One would presume this drawing was begun on Thursday. It is rather unlikely she would have gone out for another good walk. Saturday was a school day. L’Indépendant wrote that Adolphe Sax (“domicilié a Ixelles, chaussée d’Etterbeek, no 41”) had obtained a patent for his invention of the saxophone. In the description it was said to be a ‘different system of clarinet, with a different key system’. This day saw the beginning of a fierce debate in parliament and in the newspapers on the proposed new law on primary education. It was especially about the role of the clergy. For the Catholics it was a necessity that religion and morals were a necessary part of the teaching at schools. The liberals disagreed. Both sisters finished a devoir on this Thursday. Charlotte’s was named La chenille, Emily’s Le papillon. There was a party at the Pensionnat, to celebrate the end of the school year. On the day that Rachel gave her 7th performance at the Royal Theatre L’Indépendant reported that she would do six more. And that from this day she would get 3000 francs for each performance. That is about a third of the ticket sales revenue. The paper also had a list of recent marriages in Ixelles, which included the wedding of the widower of M.C.J. Gérin, possibly an ancestor or at least related to Winifred Gérin. The first day of the sisters’ holiday. Juliet Barker, in a note in her book (p. 910), wrote that M. Heger gave a talk at the Athenée Royale on this day. However, there’s no proof he did give a ‘discours’ and at any rate, the event was held at the Temple des Augustins (as the Journal de Bruxelles wrote in a review on the 17th). The main part of this end of the school year celebration appears to have been the ‘distribution of prizes.’ Heger did speak at the occasion in 1843. There was again a concert in the Park. Rachel gave her eight performance. ‘Thanks to heaven,’ l’Indépendant wrote on this day, ‘communism and Chartism are still unknown in Belgium.’ They were a great danger, it said. Only three years later Karl Marx himself came to live in Brussels for two years, during which time he wrote the Communist Manifest. Because it was Mary Assumption Day there were no newspapers. Emily began writing her poem ‘How do I love on summer nights …’. 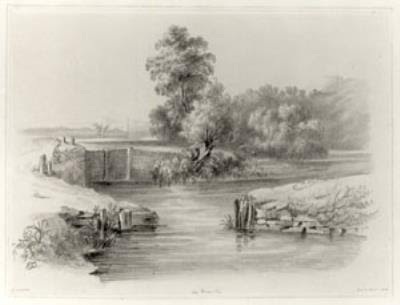 She finished it almost half a year later, on 6 February 1843. This day saw the official opening of the Salon, the big exhibition held every three year. Charlotte certainly visited it. In Villette she devotes a chapter to it. On a number of days there was free access for the people. Because of the large amount of works, paintings mostly, it would have needed two visits at least to take it all in. The Salon was held at the Palais du Musée, quite close to the Pensionnat. Charlotte finished her Le but de la vie devoir. The newspapers reported that the ‘commision directrice’ of the Salon had already started buying paintings for the lottery. One of them was Fanny Geefs’ ‘La vie d’une femme,’ described by Charlotte in Villette. 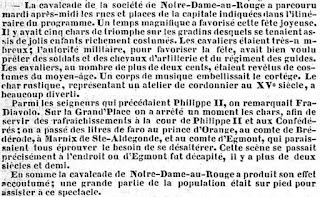 ‘At the occasion of the feast of Her Majesty,’ l’Indépendant wrote on the 27th, ‘all public buildings, ministries and foreign ambassadors’ houses were illuminated. The Société royale de la Grande Harmonie also had illuminated its magnificent façade at the Rue de la Madeleine and adorned it with the national flag. A crowd of pedestrians, invited by the fine weather, were walking on the main streets, until quite late in the evening. The curious especially went to the St. Pierre and Trois-Têtes streets, where the inhabitants celebrated the feast of St. Roch, patron of the quarter, by joyous demonstrations. These streets were elegantly decorated.’ The St Roch quarter was neighbouring the Isabella quarter. Owners of horse coaches came together at Le Cygne at the Grand Place to ‘take measures against the conduct of their drivers about which the public has so often been complaining.’ They unanimously agreed on a new set of regulations. L’Indépendant wrote about a flowering Agave Americana in the Botanical Garden. This is a rare event, as it can take 70 years for such a plant to do that. For most of the people in Brussels it would have been a once in a life opportunity to witness this phenomenon. It was welcome rain. The newspapers had regularly been reporting this month about the harvest results, in this year of the great drought. This dry and warm month hadn’t helped. Even the cows were affected, butter had become quite expensive. A weather expert said this year only compared to 1793, with regard to the duration of the warmth and dryness. In Paris the water level of the Seine had even gone below the previous record low level of 1719. The Société Philharmonique gave a “grand concert” in the Park. The entrance fee was 50 centimes. Rachel gives the last of her Brussels performance at the Royal Theatre. The news from France was that work had finally begun there on building the last part of the railway line that would connect Brussels and Paris. During this long school holiday, which would last another month, Emily began giving piano lessons to the Wheelwright sisters.